Cult of the Dead Birds: Is This Really Part of the Plan? Yesterday, I watched an interview with a couple who's home was destroyed by a tornado for the second time in eleven months. Yes, twice in less than a year, they had just finished rebuilding the house when it was demolished again. Anyway, in the course of the interview, the woman said that "She was sure that this is part of God's plan." While I'm sure she finds the thought comforting, I was appalled by the thought. 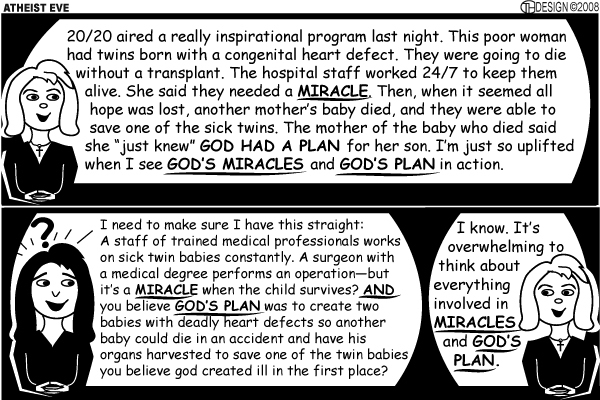 If her tragedy is part of God's plan, that means that God saw fit to obliterate her house twice. That would be a Jobian level of capriciousness. And for her to continue to profess love for such a deity implies at the very least an extreme version of Stockholm Syndrome. I am not trying to denigrate the woman's obvious faith; she is clearly and genuinely devout. What I am getting at is the idea that many profoundly religious people are suffering from a divine traumatic bonding. From Wikipedia, the definition of Stockholm Syndrome describes "the strong emotional ties that develop between two persons where one person intermittently harasses, beats, threatens, abuses, or intimidates the other." A while ago, talking with my friend Patrick, we began to question whether pets actually love us, or whether they are suffering from Stockholm Syndrome. Training a pet involves a considerable amount of behavior modification, which a pet is likely to not understand, at least a first. Their noses get rubbed in poop, they get yelled at, or other things that they find quite frightening. They come to associate those bad things with certain behaviors in a process that is called aversion therapy. But despite the behavior modification (or even more disturbingly, perhaps because of it) they still love us. Most dog trainers will tell you that a dog's love of you is mixed with a healthy dose of fear. This is not a bad thing in and of itself, because that is how a dog pack maintains it's social order. All the subordinate members are afraid of the alpha animals. Therefore, the typical dog both loves and fears its owner, and the owner intermittently intimidates the dog in the process of maintaining their status as alpha. This is the definition of Stockholm Syndrome. I would like to point out here, that the average loving pet owner does not realize that they are intimidating their pets, but they are. At the very least, a pet owner must keep their animal under control at all times, running the preponderance of their waking lives. Putting yourself in the mind of a pet, you can realize how that control could be intimidating. Fortunately, the process of domestication breeds acceptance of this into an animal. They literally depend on us as pack leader. But to return to my point, are many of the devout suffering from Divine Stockholm Syndrome? It think that this is quite likely, not necessarily from direct personal experience, but at least through projective identification. This is where we identify with the experiences of others, and then project our experiences onto them. We read the story of Job, and then take our own misfortunes in life and project those experiences into him, and consequently identify with his story. We use our life as a filter to understand his story. And his story is of a capricious and ineffable God, tormenting a just and righteous man to prove the depth of his fate. The filter of the Job story (which as my mentor Joe would say, is a Goddamned good book) teaches us that God is unpredictable and erratic, and that no matter how much we love Him, and no matter how blameless of a life we lead, he might still pot off and punish us, for no reason that we could comprehend. And identifying with this story inspires fear of God, mixed with love of God. There are many other stories in the Bible like Job: Abraham and Isaac; the expulsion from the Garden of Eden, a classic overreaction to say the least; Jacob and his brothers; Sampson, the haircut was not consentual; the list goes on and on. The Old Testament is full of stories of a jealous, vindictive God who acts irrationally, and yet his people still love him. Before you think that I am just complaining about Christianity, this is a trend in most Western religions. Look at the ancient myths, and you will see that they are full of unpredictable deities. I would like to take a minute to look at why deities would be viewed in this manner. The world was, and still is, a violent and unpredictable place. Bad things are always happening, and often to good people. Without science and satellites, the weather is completely unpredictable. Tornados can appear without warning. Volcanoes and earthquakes can level cities in the blink of an eye. Plagues can ravage the countryside. The entirety of existence is tenuous to say the least. And the stories we create about the Gods reflect this fragility. If God rules over the Earth, and unpredictable horrors occur with great frequency, obviously, God is doing it for a reason. And we work that capriciousness into our definitions of Deity. And by continuing to love him, despite all of this, we develop Stockholm Syndrome towards God. But back to my point, I have talked to many devout people, and their love of God is mixed with a healthy dose of fear; they look at God the way our dogs look at us. We have been well domesticated. And through this, when bad things happen in our lives, we defend God, by saying the bad things that happen to us are part of his plan. Somehow, though it all, our faith is reinforced by all the horror in our lives. God is capricious, and we still love him. He inflicts misery on us intentionally, and we react with Stockholm Syndrome. But I prefer a different way of looking at it. There is a quote from Babylon 5, which is one of my favorite television shows. In it one of the characters says, "You know, I used to think it was awful that life was so unfair. Then I thought, wouldn't it be much worse if life were fair, and all the terrible things that happen to us come because we actually deserve them? So, now I take great comfort in the general hostility and unfairness of the universe." I think it is a healthier way to view the world.